The Best Emotional Intelligence Blogs from thousands of instructing blogs and Emotional Quotient Blogs using search and social metrics. Subscribe to these websites because they are actively working to educate, inspire, and empower their readers with frequent updates and high-quality information. Emotional Intelligence newsletter is a comprehensive summary of the day's most important blog posts and news articles from the best Emotional Intelligence websites on the web, and delivered to your email inbox each morning. To subscribe, simply provide us with your email address. About Blog Six Seconds is a community of changemakers contributing to a world of insight, connection, and purpose. We think the world would be a better place if a billion people were practicing the skills of emotional intelligence (EQ). So, we research and share scientific, global, transformational tools & methods to support that goal. Facebook fans 72,045. Twitter followers 8,556. United Kingdom About Blog A revolution has taken place in our understanding of what intelligence is, how to use it, and how to develop truly outstanding leaders, managers and entrepreneurs. For the past 17 years, Scott Watson has equipped, enabled and actively encouraged business leaders, aspiring managers and passionate entrepreneurs to bridge the gap between where they are now and where they really want to be. Facebook fans 65. Twitter followers 390. Washington, D.C. About Blog The CliftonStrengths Coaching Blog is a resource for those who want to help others discover and use their strengths. We have Gallup experts and independent strengths coaches share tactics, insights, and strategies to help maximize the talent of individuals, teams, and organizations around the world. Facebook fans 39,636. Twitter followers 30,862. UK About Blog Follow us to keep up with Andy Smith's blog which features Emotional Intelligence, Appreciative Inquiry, NLP, leadership, training and coaching skills. Facebook fans 683. Twitter followers 3,604. Facebook fans 19,988. Twitter followers 2,236. About Blog Learning In Action Technologies offers individuals, teams, and organizations effective tools and methods for enhancing Emotional Intelligence in relationship, real-time. We primarily serve leadership development consultants, executive and life coaches, trainers, educators, and leaders who understand a key role they play is in developing individuals and teams to be their best. Melbourne, Australia About Blog This personal development and emotinal coaching blog is written by an experienced Life Coach to equip, encourage and inspire people to take meaningful action and make a positive difference in the world. Facebook fans 1,477. Twitter followers 331. Denver, CO About Blog This Institute is the most comprehensive social and emotional intelligence assessment instrument on the market today. At the Institute we offer training in social and emotional intelligence, and coaching and assessment services to coaches, consultants, HR professionals, interested individuals, leaders and executives. Facebook fans 3,783. Twitter followers 1,965. About Blog As a coach I serve clients who have a sense that something is not quite right in their life, who feel stuck, are in the midst of a big life or professional transition, at a threshold and who are faced with "New Beginnings". Designing Your Life is a movement to build a well-lived, joyful life with Bill Burnett and Dave Evans. This beloved Stanford class is now a book for all. Twin Cities, MN About Blog Matt Norman is President & CEO of Norman & Associates, which offers Dale Carnegie programs in Minnesota, Iowa, Nebraska, and South Dakota. Dale Carnegie provides its tools and courses through a global network, helping to improve the way people think and work together. Norman & Associates also offers practical talent strategy in the areas of hiring, onboarding, strategic planning, and goal alignment. Facebook fans n/a. Twitter followers 651. About Blog Yin and Yang Mom focuses on balancing the light and dark of motherhood; marrying internal and external forces so they can co-exist in harmony. Facebook fans 429. Twitter followers 6. Asheville, NC About Blog Drs. Joy and Roy are Holistic Health Experts informing the public, specialists and scholars about the most innovative methods, techniques, practices that will lead not only to health and wellness, but transform lives fundamentally, spreading love into the universe. Create the life you were meant to live. Facebook fans 19,438. Twitter followers 2,083. About Blog Branding. Communications. Digital Marketing for individuals, small biz and non-profits. Adding a psychological dimension to help you get the better result. Facebook fans 22. Twitter followers 1,591. About Blog Emotional intelligence is a break through approach, a powerful way of looking at people and behavior. It is an integrated approach that combines thinking and feeling to make optimal decisions. Facebook fans 8,820. Twitter followers n/a. About Blog Emotional intelligence coaching and workshops by emotional intelligence coach and consultant Guy Farmer. Emotional intelligence test and help managing emotions. I also have twenty-four years of experience helping people overcome difficult life challenges. About Blog I am going to listen to you deeply in a non – judgmental way and help you clarify what you want. We will spend whatever time needed to discover the unique calling that makes you special. Then, the challenge can become an opportunity with the power to enlighten your life, bring inner peace and structure. Life coaching is a journey that helps you find fresh energy and a new perspective of things to start living the life we always wanted instead of just dreaming of it. Facebook fans 205. Twitter followers 10. Victoria, British Columbia About Blog Emotional intelligence can help you and with leadership training or certification, you can help your team. We have courses for senior leaders, and for new managers. We are a leading North American provider of EQ-i 2.0 certification and EI courses for those that want to provide this training and programming for others. Facebook fans 1,692. Twitter followers 197. Ilupeju, Nigeria About Blog Pause Factory is Africa’s premier Emotional Intelligence Academy that is 100% dedicated to the development of people through Emotional Intelligence Competencies. We deploy EI Assessment, EI Training, EI Coaching, EI Certification and we soak all other workplace and family learning needs into Emotional Intelligence Competencies. Facebook fans 9,319. Twitter followers 644. About Blog ConneXions teaches people to live honest, responsible, and humble lives. We believe that everyone can overcome their shame and addictions in order to live happy, fulfilling lives and use these necessary tools to liberate themselves of fear and disconnection. About Blog Every single action (or inaction) in your life is driven by a feeling. In my personal and professional experience most of us are not fully in tune with the whole palette of our emotional experience. Not anywhere near to it. Kansas City, Missouri area About Blog The main goal of my blog is to provide an information bridge between the legal profession and applied psychological science. Psycholawlogy.com exists to help legal service providers of all kinds including lawyers, judges, professors, and others, get connected with sound applied behavioral science and discover ways to better understand themselves, their clients or customers, and their work and workplaces so that they can find balance between work and personal life. Facebook fans n/a. Twitter followers 133. About Blog Emotional Intelligence Hub is a place where everyone interested in Emotional Intelligence can come to learn more about it. We strive to provide our community members with articles and quotations that serve to widen their perspectives and skills. Facebook fans 1,188. Twitter followers 44. Newcastle, New South Wales About Blog BU Coaching Newcastle is an online coaching organisation which helps you to escape anxiety and stress and find confidence and purpose in every day. Facebook fans 2,174. Twitter followers 7. Davis, CA About Blog The Happy Quotient is an emotional intelligence system driving humanity towards a happier and more fulfilled existence. Taking the Pursuit of Happiness into a personal guide, the HQ program is a daily tool to reaching & maintaining our happiest levels of being - even through adversity, revolutionizing the way we handle a bad day. Facebook fans 87. Twitter followers 551. Mayfair About Blog Mayfair Coaching Lounge is a London based Person-Centered Life Coaching and Therapy service specialising in Transformation Coaching, Cognitive Behaviour Therapy, NLP and Ericksonian Hypnotherapy. Facebook fans 61. Twitter followers 3. About Blog Specialising in team leadership, interpersonal dynamics, and psychometrics, my work has taken me to over 20 countries, and enabled me to collaborate with a wide variety of businesses, in both private and public sectors. About Blog Rebecca “Kiki” Weingarten is a Corporate, Education and Life Coach and the Co-Founder and President of NYC based Tradecraft Coaching and Consulting. She coaches individuals, corporations, government, non-profits, educational institutions, edutainment and entertainment companies to enable them to grow and transition effectively and to attain their goals through individual coaching, program development and on-site training, workshops and seminars. 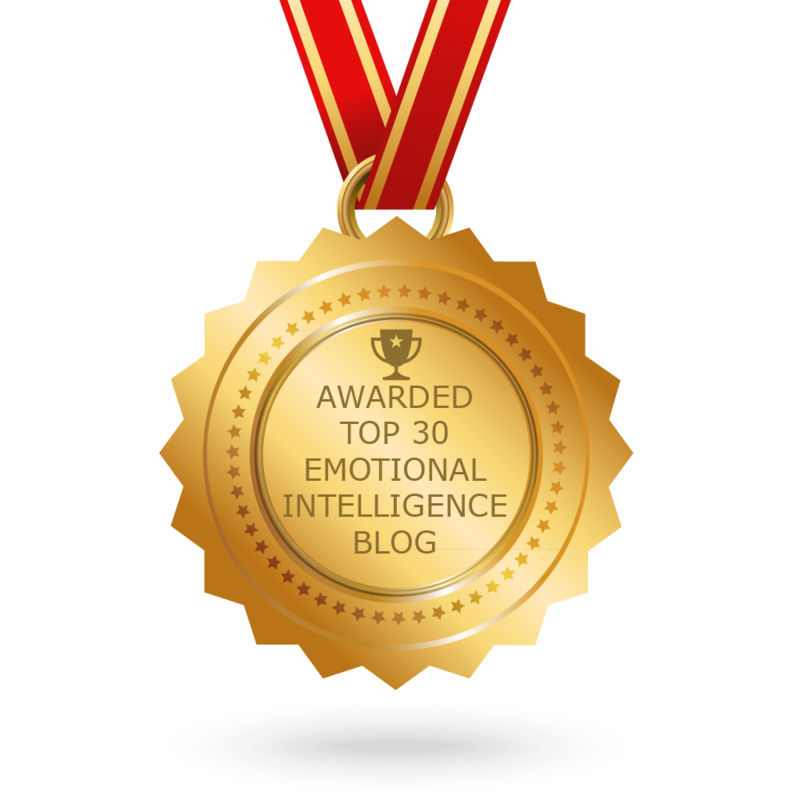 CONGRATULATIONS to every blogger that has made this Top Emotional Intelligence Blogs list! This is the most comprehensive list of best Emotional Intelligence blogs on the internet and I’m honoured to have you as part of this! I personally give you a high-five and want to thank you for your contribution to this world.